Orchids are a diverse and widespread family of flowering plants with blooms that are often colorful, showy and fragrant. The showy orchids favored by most people are usually either phalaenopsis hybrids or dendrobium hybrids. Phalaenopsis (Moth Orchid) is the most common of the Orchid family. The golden rule for orchid success is to duplicate the plant's natural conditions as closely as possible. Orchids prefer bright light, but no direct sun. Water them thoroughly once or twice a week - more when it's warmer, less when it's cooler. A pencil or a wooden skewer inserted into the soil will come out almost dry, indicating it’s time to water again. Make sure the water drains completely out of the holes at the bottom of the pot. Never leave the plant sitting in water! Placing ice cubes on the soil surface, to provide slow even watering as they melt, works great for watering. Provide some humidity for the plant; most do not like very dry environments. Gentle air circulation is also good for orchids. Keep the daytime temperature between 65°- 75°F /18°- 24°C with a nighttime temperature drop of just a few degrees. In nature, most orchids are epiphytes, meaning they grow on other objects, clinging to rough bark or even stone. With that in mind, the growing media can be made up largely of bark chunks. Most garden centers offer Orchid soil mix that will work well. Orchids also tend to prefer smaller pots. 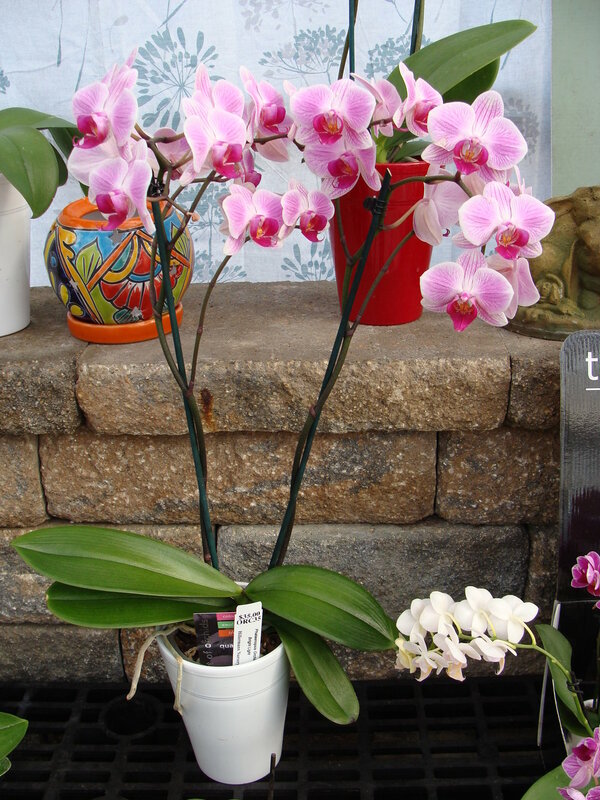 If a pot is too large, the orchid will expend most of its energy rooting, and show no real new growth or foliage for months, so keep the containers small. They prefer being somewhat root-bound with their roots protruding from the top of the media (or aerial roots should simply hang free). However, as plants produce more new canes or spikes, they can eventually outgrow their pot. Orchids can be fertilized once a month - or when they are blooming only. Look for fertilizers that contain nitrogen (N), phosphorous (P) and potassium (K), plus trace elements like iron (Fe). Do not over feed orchids - this can damage them. If you're growing your orchid on bark, use a fertilizer that's significantly higher in nitrogen (in a ratio of 30(N)-10(P)-10(K)). The bacteria in the decomposing bark will consume a lot of nitrogen. Water your orchid thoroughly before feeding.